-Used for corner punching combination of aluminum window& door, four corners connecting at one time is available. -Clamping device can auto move forward/backward, making the operation convenient. -The frame is specially jointed by steel with high quality and special process. -The CNC system imported from MTSUBISHI,japan with high quality ensures the speed and accuracy. -The moment control function of the service system can auto-press the four corners ensuring the processing effect. -The corner-crimping blade can be adjusted according to the requirement of different profile. -One time corner crimping can control the seam and plane, make the quality foresight. 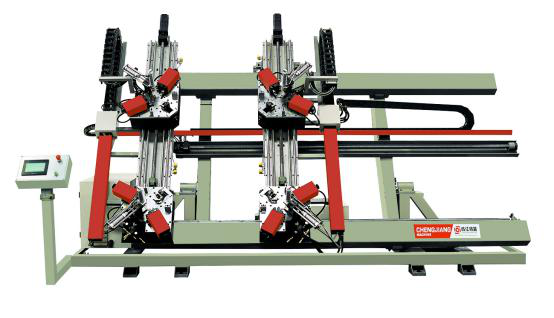 -The control system service system make the connect no-seam and improve the control accuracy.